Prominent ears—ears that stick out too far from the head—are not only regarded as unattractive in most societies,but are one of the few facial features that becomes a target for teasing and ridicule. For this reason, patients with prominent ears often seek correction of this deformity during childhood, but patients of any age can be candidates for correction. A young woman, for example, may be self-conscious about her prominent ears and avoid wearing her hair up. Likewise, most men's hairstyles crop the hair ear correction close to the sides of the head, which can make prominent ears on a man all the more distracting. Usually prominent ears are an inherited deformity passed down from either maternal or paternal genes and occurs while the patient is still in the womb. 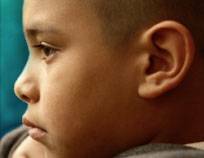 As a genetic trait, prominent ears are not the result of anything the patient or his/her parents did or did not do. 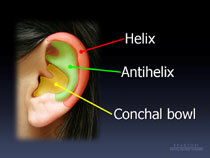 Most commonly, the ears take ear correction on the shape of so-called "cup ears" with a deep conchal bowl and an inadequately furled antihelix. Many other variations are possible to produce prominent ears, resulting in such descriptive terms as "lop ear", "shell ear", and "Stahl's ear", for example. More than four percent of the people in the world think that their ears stick out too much. Ears are one of the first parts of the body to reach full size,at about five to six years, which is why protruding ears can be more noticeable in children. The most common treatment for prominent ears is an operation called pinnaplasty - also known as an otoplasty or "ear pinning" operation. This reshapes the cartilage in the ear and uses stitches to hold the ears back. Sometimes stitches in the cartilage are used alone. There is no medical need to have a pinnaplasty, but people with prominent ears can feel unhappy with their appearance and may lose self-confidence. Children are particularly vulnerable to teasing, which can cause great distress. It is best to wait until your child is over five years to do the operation, as until then the cartilage is very floppy and does not hold the new shape well. It is also important to talk to your child and wait until your child recognises the problem and wants their ears corrected. Children are generally more co-operative and happy with the outcome when they fully understand why the surgery is taking place. In adults and children, pinnaplasty is the only way to permanently pin back the ears. In babies younger than six months, it is possible to flatten the ears using special moulds. This is a plastic splint that fits in the rim of the ear and reshapes the cartilage while it is still soft. The splints are taped in place and left for weeks or months, depending on the age of the baby. 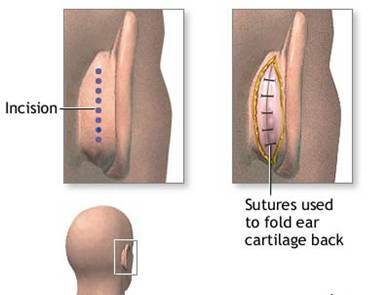 By the age of six months, the cartilage is too hard to be remoulded and a surgical operation is required. What happens before a pinnaplasty? In our Cosmetic Center, surgeon will discuss how to prepare for the operation. You will be asked about your, or your child's, medical history and have a full examination. What should I expect in hospital? Before surgery you will talk to your surgeon about the operation and you will be asked to sign a consent form either for yourself or on behalf of your child. This confirms that you understand the risks, benefits and possible alternatives to the procedure and have given your permission for it to go ahead. Your, or your child's, ears will be examined and their shape and size will be measured. A photograph will usually be taken before the operation so that the results of surgery can be compared with the original appearance. The surgery can be carried out under a local anaesthetic, in which case the area around the ears will be numb but you, or your child, will be awake. A general anaesthetic is also an option, particularly for young children, and means that they will be asleep throughout the procedure and will feel no pain. If the operation is done under a general anaesthetic, fasting instructions must be followed. Typically, you must not eat or drink for about six hours before a general anaesthetic. However, some anaesthetists allow occasional sips of water until two hours beforehand. Thousands of ear surgeries are performed successfully each year. The surgery is performed while the patient is awake but pain free or deep asleep and pain free. The procedure usually lasts about two hours, depending on the extent of the correction needed. Stitches are then used to close the cuts in the skin, which need to be removed about 5 to 10 days after surgery. Alternatively, dissolvable stitches may be used, which means they do not need to be removed. Finally, a bandage is wrapped around the head and over both ears. This is to protect the ears and keep them held in the new position while they heal. It is recommended that parents stay alert to their child's feelings about protruding ears, not insisting on the surgery until the child wants the change. Children who feel uncomfortable about their ears and want the surgery are generally more cooperative during the process and happier with the outcome. Some exams are previously requested. The use of medications containing salicylic acid or vitamin E should be avoided 10 days before surgery. Smokers should quit smoking 15 days before surgery. It is necessary to stop any oral intake 8 hours before surgery. Painkillers will be given to help with any discomfort as the anaesthetic wears off. Most adults are able to go home on the same day a few hours after their operation. Children usually go home under the care of their parents. If you have had a general anaesthetic, you will need to arrange for someone to drive you home and should try to organise for a friend or relative to stay with you for the first 24 hours. Before going home, a nurse will give you some advice about how to care for the ears and make an appointment for any stitches and bandaging to be removed. The head will be wrapped in a bulky bandage immediately following surgery to promote the best molding and healing. Within 3 days,ear correction the bulky bandages will be replaced by a lighter head dressing similar to a headband. Stitches are not usually removed, and will dissolve, in about some weeks. Any activity in which the ear might be bent should be avoided for a month or so. Most adults can go back to work about 3 days after surgery. Children can go back to school after 7 days or so, if they're careful about playground activity. Most patients, young and old alike, are thrilled with the results of ear surgery. But it is necessary to keep in mind the goal is improvement, not perfection. The use of a compression garment is indicated. This tight-fitting garment reduces swelling by preventing fluid build up, as well as provides comfort and support during healing. Depending on the extent of surgery, the patient has to wear the compression garment up to 7 days full time and at night to sleep during another 30 days. As with any major surgical procedure, the patient most likely experience bruising and swelling, which subside later, within few days. . Sun exposure and sea or swimming pools bathing are liberated after 30 days. Customarily otoplasties are not associated with pain, only sometimes patients equivocally interpret as pain a sensation of ear fullness caused by cartilage repositioning, witch subsides after a few hours. Once home, painkillers such as paracetamol or ibuprofen should be taken regularly or as needed, as advised by the hospital. It can help to sleep propped up on pillows on the night after the operation. To help the ears settle in their new positions, a bandage should be worn for one to two weeks. This will cover the ears so may make it difficult to hear but it is important to help the ears heal. The ears may itch as they heal but it is important not to reach under the bandaging to scratch, as this can cause infection or poor healing. Once the bandage has been removed, it may be necessary to wear a smaller and lighter headband for another few weeks. Some people need to wear this day and night, others at night time only to stop the ears being bent forward against the pillow when sleeping. The length of time the bandage needs to be worn depends on the exact type of operation that is done. Our surgeon will give you more advice about this. Our surgeon or nurse will also ear correction advise you on when you can go back to work, or your child to school. It is best to wait at least four weeks to do activities such as swimming but you can usually wash your, or your child's, hair after about one week. It's important not to rush into the decision to have a cosmetic operation. It is sensible to discuss the issue with your GP, who may be able to recommend reputable surgeons, or give advice about how to choose which hospitals to be treated in. A pinnaplasty is a commonly performed and generally safe surgical procedure. For most people, the benefits in terms of improved appearance are usually greater than the disadvantages. However, in order to make a well-informed decision and give your consent, you need to be aware of the possible side-effects and the risk of complications. Complications are unexpected problems that can occur during or after the procedure. Most people are not affected. The main possible complications of any operation are bleeding during or soon after the procedure, infection and an unexpected reaction to the anaesthetic. • an infection in the wound that may make the ear swollen and painful and cause the wound to weep - this is normally treated with antibiotics and regular dressing changes, but in rare cases further surgery may be needed to drain the infected area. • a blood clot in the skin of the ear, which may dissolve naturally or may need to be drawn out with a needle. • the development of unusually red or raised scars, which some people have a genetic tendency to form. • asymmetrical ear position - in a few cases further surgery may be necessary to readjust the ears. • there is ear correction a risk that the correction of the prominent ear does not last permanently and the ear 'springs back' into its original position, but this is rare. The chance of complications depends on the exact type of procedure that is being performed and other factors such as your general health. Your surgeon will be able to explain how the risks apply to you.